Geriatrics encompasses clinical care for older adults, typically defined as those people 65 years of age and older. Changes in voiding function are common with advancing age and may be due to structural and functional changes in the lower urinary tract system. Underactive bladder (UAB) has been recognized as a relatively common finding in older adults and appears to affect this population disproportionately compared to younger people. This is likely due to interactions with other comorbid conditions such as benign prostatic hyperplasia or other causes of bladder outlet obstruction, progressive neurologic disorders that affect the bladder, and other conditions such as diabetes mellitus. 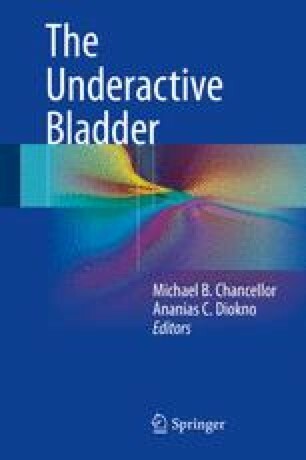 Evaluation and treatment of UAB in the geriatric population can be challenging and requires an understanding of both the normal and pathologic changes in bladder structure and function. Therapy is often targeted at improving bladder emptying and may require interventions such as clean intermittent catheterization or indwelling catheter placement for drainage. Depending on functional status, older adults may require assistance from caregivers in order to perform these treatments. Successful therapy can help to reduce associated problems such as overflow incontinence and may help to decrease rates of urinary tract infections and other problems. This chapter reviews the etiologies of UAB in the geriatric population, and special considerations for evaluation and management in this age group.